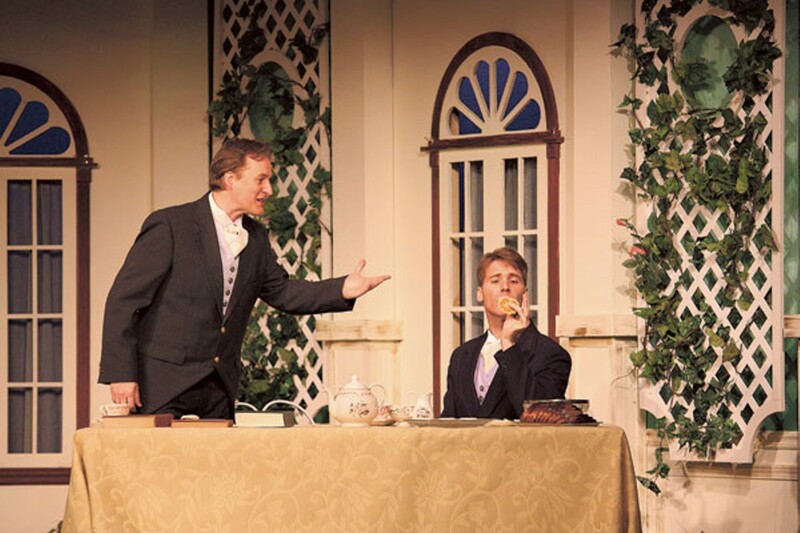 They were planning to open The Importance of Being Earnest on January 22 at Theatre Charlotte, where Oscar Wilde’s “Trivial Comedy for Serious People” hadn’t played since 2002. 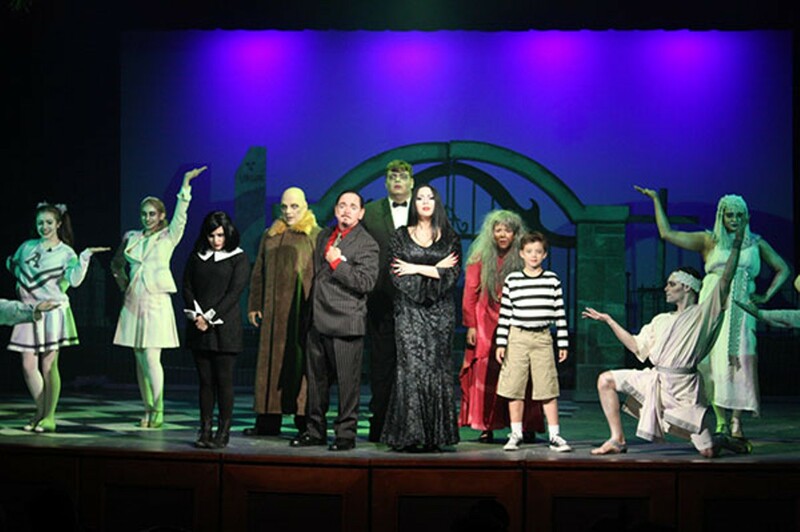 But the snow and sleet that were icing the roads hadn’t begun to melt away on the following evening, so opening night was transformed into an opening Sunday matinee. Even if I had been able to scale my icebound driveway, I was already booked for the opera at Belk Theater. After all the reshuffling on my iCal, my wife Sue and I were finally able to catch up with Wilde’s menagerie of smart alecks at the second Sunday matinee, nine days after the originally scheduled opening. With so many other reshufflers in the crowd, the Queens Road barn was close to capacity. An extra performance has been slated for 2:30 this Saturday to help out other migrants. The airy sophistication of Joshua Webb’s set design boded well for the blizzard of bon mots to come, but who were these Ernests opening up the action, Lance Beilstein as the roguish Algernon Moncrieff and Jon Ecklund as the deceitful John Worthing? Beilstein had briefly blipped on my radar last year when he was cast in a stage adaptation of Casablanca that didn’t happen. and Ecklund had never performed on a Charlotte stage before nailing his audition as Wilde’s protagonist. Yet they instantly established a fine rapport, hinting early on that Algy and Ernest — as John calls himself in London — were not only great friends but kindred spirits. There was a problem, however, even before the divine ladies arrived. Though their chemistry was sparkling, Beilstein’s cue pickup was razor sharp while Ecklund’s was erratic. Not a symptom you would expect from your lead at the end of your second week. Ecklund’s symptoms became more serious during the scene change between Acts 2 and 3. In fact, he was taken to the hospital, reportedly suffering from dizziness, and didn’t reappear. Johnny Hohenstein, who plays John’s butler at his country home, bravely substituted for Ecklund during the final 19 minutes, script in hand. That forced the imperious Lady Bracknell to announce herself when she triumphantly reappeared. The waters were already troubled in Act 1 when Jill Bloede, amply bustled in a floor-length dress, first floated in like a majestic tugboat as Her Ladyship. It was she and she alone who must approve of Ernest as the prospective husband of Algy’s cousin, Miss Gwendolen Fairfax — a grim prospect, since her wicked nephew has already devoured all the cucumber sandwiches. Lady B attempts to be judicious. Ernest’s income of seven to eight thousand pounds, the equivalent of $1 million annually according to the Norton Edition of the text, actually counts in his favor. It’s Ernest’s lineage that is an insuperable stumbling block, for he cannot trace his family any further back than a leather handbag! My, how Bloede huffs when she repeats that fatal word, nearly adding an extra syllable to it each time she lingers on the first letter. Lady Bracknell’s contempt was so hilariously absolute that when she exited, leaving Ernest and Gwendolen’s hopes of marital bliss in shambles, the audience erupted in lusty applause. By the sort of insane coincidence that Wilde uses to resolve Ernest’s difficulties, Bloede’s name rhymes with Lady. So, after her current triumph, Jill is no more: she will no doubt have to suffer being called Bloede Bracknell for the rest of her days. You may revise my headline accordingly. Needless to say, Bloede’s arrival calmed any worries that this production, directed by Tonya Bludsworth, would be anything less than a delight. Eleven years after starring in NC Shakespeare’s Twelfth Night, Gretchen McGinty’s professionalism still gleams with vitality and caprice as Gwendolen, irresistible despite her perverse silliness. She accepts Ernest, but only for the shallowest of reasons — she’s the perfect antithesis of Juliet. Caprice continues to rule when we arrive at John’s country home for Act 2, where we meet his lovely ward, Cicely Cardew. Her requirements for a prospective husband are not merely similar to Gwen’s. They are exactly the same, obliging both John and Algy to make christening appointments with the Rev. Canon Chasuble. Under the watchful eyes of Cicely’s governess, Miss Prism, Algernon has snuck into John’s home, pretending to be his fictitious brother Ernest, and swept Miss Cardew off her feet. That’s partly because Miss Prism’s eyes are devotedly affixed to the Reverend. As we’ll learn in the denouement, it’s not the first time Miss Prism’s attention has wandered. Further complicating John and Algy’s attempts to live double lives, Gwen follows her would-be fiancé into the country — with her mother barking at her heels. The running joke of Act 2, amid all the confusion of who’s really betrothed to Ernest, is the radical shifts of sisterly love and murderous hatred between Gwen and Cicely. Mixed in with devout cynicism and decadence, punctiliousness and pomposity squandered over trivialities are the key ingredients of Wilde’s satire, and Bludsworth has her entire cast embracing it with the proper élan. Emily Klingman is hormone-driven innocence in a lemon chiffon dress as Cicely, assiduously transcribing Algy’s marriage proposal into her teen diary, and Hank West bumbles quite sanctimoniously as Rev. Chasuble when he manages to recall where he is. Scrunched up like a squirrel, Stephanie DiPaolo is the essence of fretful and incompetent spinsterhood as Miss Prism. Bludsworth also differentiates nicely between the servants. Ron Turek is urbane and dignified as Algy’s man, Lane; while Hohenstein, tasked to distraction by his temperamental superiors, is more apt to let his resentments play over his face as John’s butler, Merriman. Or he was until he was obliged to pick up Ecklund’s script and stand up to Bloede Bracknell. Not at all plagued by postponements, The Miraculous Journey of Edward Tulane opened at ImaginOn last weekend in as polished a production as you’ll ever see from Children’s Theatre. It’s a gem that will no doubt remind longtime subscribers of The Velveteen Rabbit, since the title character is a rabbit doll. Ah, but Edward is fashioned entirely of porcelain, except for his furry ears and tail (he prefers not to think about the origin of his whiskers). Adapted by Dwayne Hartford from the novel by Kate DiCamillio, Edward’s story begins when he is given to 10-year-old Abilene Tulane on Egypt Street by her mysterious grandmother Pellegrina, the only human who knows his heart. Unlike the Velveteen, Edward does not aspire to be real or human, but he is frustrated when Abilene doesn’t set him in a place where he can see the outdoors and the stars through her window. Even before he is severely broken many years later in Memphis, Pellegrina perceives his flaws, and the inference is that he must suffer for them. But Edward’s sufferings and adventures will be epic ­— beyond human, to tell the truth. Our protagonist remains the three-foot doll the DiCamillio created, but Mark Sutton is always close by to articulate his thoughts, shouldering and picking a banjo as Edward morphs into Susannahr, Malone, Clyde, and Jangles during his odyssey on land and under the sea. Margaret Dalton figures most prominently as the bereft Abilene, but she resurfaces on numerous occasions during Edward’s journey, most notably as a frisky dog. Beginning as the semi-exotic Pellegrina, Allison Rhinehart ranges across multiple roles and genders, last seen as Lucius Clark, the sagely doll mender. Devin Clark rounds out the cast, shapeshifting from fisherman to hobo to handyman when he isn’t slyly inserting sound effects. Pure enchantment for 81 minutes.